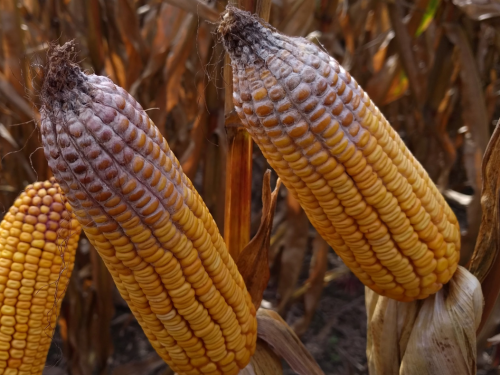 Columbus, Ohio (January 10, 2019)--A wetter than normal summer and fall in Ohio led to the worst spread of a toxin on corn in at least a decade, according to a grain disease expert with The Ohio State University. And next year�s crop may be at risk as well. The fungus that produces the toxin can survive the winter, particularly if stalks or other plant material from the 2018 corn crop are left on the surface of the soil, said Pierce Paul, an Ohio State University Extension specialist in corn and small grain diseases. OSU Extension is the outreach arm of the College of Food, Agricultural, and Environmental Sciences (CFAES). The extent of vomitoxin across Ohio and the rest of the Corn Belt led some farmers to receive a lower price for their crop, Paul said. And any corn left standing in wet fields becomes more susceptible to vomitoxin, Paul said. �I know there were farmers who had problems with price discounts, and some had their grain completely rejected,� Paul said. Moldy corn still can be used to produce ethanol. But the byproduct of ethanol production, typically a rich source of nutrients for animals, cannot be given to them because it will have a high concentration of vomitoxin, Paul said. Vomitoxin can also contaminate wheat and barley. However, in Ohio, both of these crops were harvested by the first few weeks of July and were out of the fields before the persistent rains came, Paul said. Not every cornfield had a problem with vomitoxin, because rainfall amounts are never uniform across the state. The fields that were tainted with vomitoxin could still be a problem next season if the same or another susceptible hybrid is planted, Paul said. Gibberella ear rot can survive in a field through winter and potentially harm the new crop if wet weather occurs, and �there�s nothing you can do after the fact� to control the disease, Paul said. As a result, it�s important for farmers to choose corn seed that�s resistant to the fungus, he said. No corn hybrid is totally immune to Gibberella ear rot. In a field contaminated with vomitoxin, burying the stalks and other plant material that remain will help reduce, but won�t eliminate, the spread of the fungus in next year�s crop, Paul said. Symptoms of Gibberella ear rot include pinkish mold. But it can be easy to overlook if a growing crop has been tarnished by the fungus because the husk covers up where the damage occurs, on the ear of the corn.